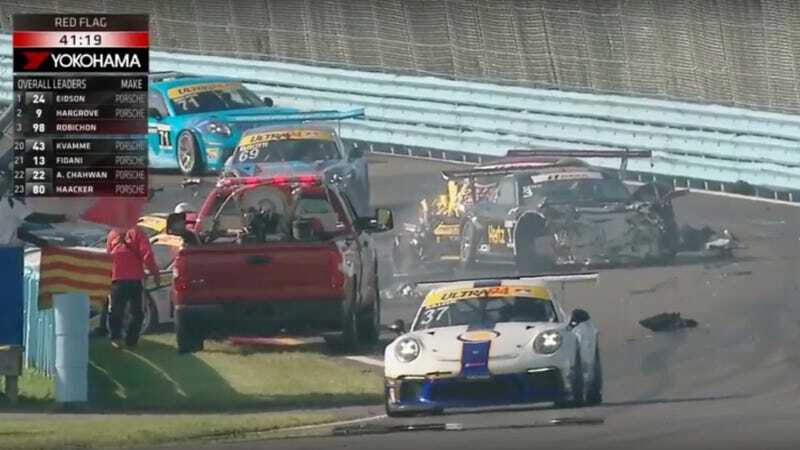 Friday’s Porsche 911 GT3 Cup race at Watkins Glen had to be halted and abandoned after a massive pile-up involving at least nine cars sent four drivers to the hospital, per IMSA. The crash happened in the fast esses of the track on the second lap of the race. As the commentators on the video noted, it’s a section of the track over a crest where it’s hard to see what’s happening ahead. Five drivers involved in the wreck were checked at the infield care center and released. Four others were taken to area hospitals. One of those four injured drivers had to be airlifted out of the track by helicopter, per those at the track whose comments were relayed to Jalopnik. No further updates have been given for anyone except Jeff Mosing, who is known to have suffered back pain as a result of the crash, per racing driver Ryan Eversley. Mosing was conscious after the crash and taken by ground to the hospital. 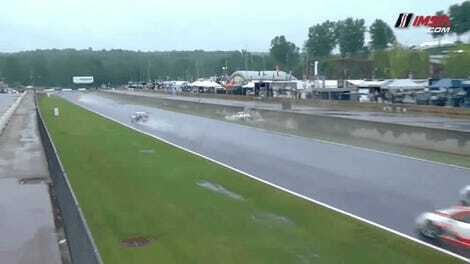 The race itself was not restarted due to the amount of damage involved. The series will attempt to make it up in with a new race at a later date. 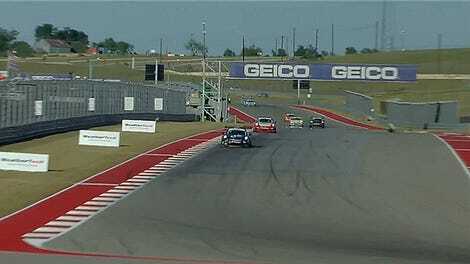 Today’s race was one of the support races for the WeatherTech Sports Car Championship’s 6 Hours of the Glen. Jeff Mosing felt good enough to hop into his car for today’s Continental Tire Sports Car Challenge race at Watkins Glen, where he currently leads the race. Correction: Originally one of the two involved in the original collision was misidentified as Mark Kvamme’s, when it looks to have been Trenton Estep’s instead. This has been fixed above.